You've put in the time and hard work–now it's time to enjoy the fruits of your labor. Turn the equity you’ve built up into a home equity line of credit (HELOC). A home equity line of credit offers lower rates than traditional credit cards and provides you with quick access to cash whenever you need it. Use it to finance a major purchase or for peace of mind with unexpected expenses, including debt consolidation, educational costs, medical expenses, home renovations, and more. Do I need to be a member TruWest Credit Union to receive a home equity line of credit (HELOC)? Yes. A membership is required if you are approved for a HELOC. What is the difference between a home equity loan (HE loan) and a HELOC? Some of the benefits of a HELOC is its flexibility with the revolving line of credit and low closing costs. This is a great option for homeowners who want to borrow less money, withdraw their funds, as needed rather than all of it upfront. May I make a principal only payment? Interest on a HELOC accrues on a daily basis on the then existing principal balance. Payments are applied first to interest owed, then to fees (if any), with the remainder applied to principal. Industry standard HELOC contracts do not make an exception for principal only payments, but as a special accommodation, TruWest members may make such principal only payments at our branch locations. The savings of principal only payments, however, are surprisingly small. 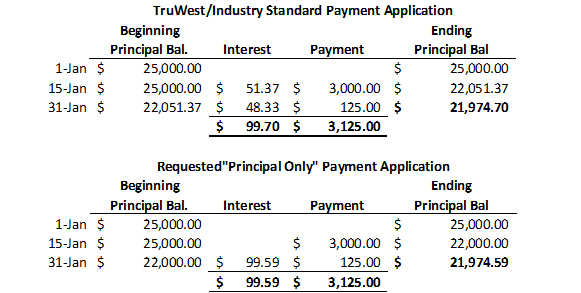 Below is a sample of a $3,000 principal payment made, in addition to, a regular $125 monthly payment on a $25,000 HELOC loan, with interest at 5%. After payment of all accrued and unpaid interest and any fees, additional amounts paid will be applied to principal and reduce future interest accruals. The savings of principal only payments may be slight. Note, in the example, the savings are only 11 cents (the difference between $99.70 in interest and $99.59 in interest). This is an example for illustrative purposes only. Actual amounts, terms, and accruals will vary. Regular minimum monthly payments must continue to be made and may not be designated as principal only. Please visit a TruWest branch for further information. 1 No appraisal necessary for credit lines less than $100,000. Property valuation must meet TruWest requirements.